- START HERE by informing yourself about the initiatives of your local community. 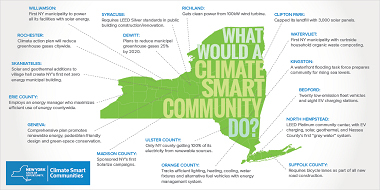 Climate Smart Communities is a program of the New York State departments of Environmental Conservation, Health, State and Transportation; State Public Service Commission; and State Energy Research and Development Authority. Reducing GHG Emissions: Starting now to reduce GHG emissions and create permanent carbon sinks that remove GHG emissions from the atmosphere - these actions will help stabilize atmospheric levels of carbon dioxide at manageable levels and avoid severe climatic changes. Adapting to a Changing Climate: Altering the built and natural environment in anticipation of predicted climatic changes, or in response to actual changes, will alleviate the risks associated with unavoidable changes in climate. Many municipalities begin by reducing emissions and increasing climate resilience in municipal operations alone, but action by the entire community is needed to make significant reductions in greenhouse gas emissions and to successfully adapt to unavoidable climate change. Local governments can act directly to reduce fossil fuel consumption in municipal buildings and vehicles, to improve solid waste management practices and to adapt infrastructure and operations for resilience to anticipated changes as the climate warms. Flooding and changes in precipitation and snow pack that may affect water supplies are of special concern to localities. To help the broader community act, local governments can enable climate-smart practices through land use plans, zoning and building codes and efficient transportation policies. A key local government role is leading, educating and setting an example of energy efficiency and adaptation. List of Climate Smart Communities. For more information, visit the DEC Energy and Climate website.